We love sports and celebrate what they bring to our lives! This whimsical 3/4 inch snap bracelet is perfect for the sports fan who wants to share their love of the games and add a little style to their day. Teags & Ry features a metal plate with Sports ♥ engraved into the nickel silver. This cuff has two snap closure settings to help you get a perfect fit, select sizing XS-M. The leather is hand dyed, distressed and sealed for light weatherproofing. Our first custom socks - the perfect gift for sports fans of all ages. Red & white color-way to celebrate the Holiday season (and your sport)! Green/Red color-way to celebrate the season (and your sport)! Teags & Ry custom stainless steel hockey player travel tumbler is ready to go along and celebrate all your sports!! Teags & Ry custom stainless steel hockey player travel tumbler is ready to go along and celebrate all your sports!! 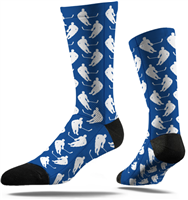 Our first custom socks - the perfect gift for sports fans of all ages. A neutral color-way to wear during all seasons to celebrate your sport. Hockey Sock - Orange Repeat Player BACK IN STOCK! An orange/black color-way to wear during all seasons to celebrate your sport. Wear during all seasons to celebrate your sport. A color-way to wear during all seasons to celebrate your sport. An red/black color-way to wear during all seasons to celebrate your sport. One Size Fits All - Standard Fit I can do all things through Christ who strengthens me. A reminder that He is always with you. Work hard. Have fun. I love you. A constant reminder that you're always with them and supporting them during the best days, hard days and all those in between. This 1/2 inch leather cuff is perfect for gift giving with it's adjustable two snaps. Handmade in York, Pennsylvania Perfect for the best hockey mom you know! Teags & Ry celebrates hockey moms and hockey families. This skinny key chain is made of 1/2 inch wide leather with a brushed finish nickel silver plate that has the words "Hockey Mom" engraved into a metal plate. The keychain has metal plates on one side, and is sealed for weatherproofing and is made of thick tooling leather to ensure it holds up against everyday use. Handmade in York, Pennsylvania Hockey Grandmas make us so happy! Teags & Ry celebrates everyone in your hockey family. Give this as a gift to your hard-working, proud-as-heck hockey grandma! This skinny key chain is made of 1/2 inch wide leather with a brushed finish nickel silver plate that has the words "Hockey Grandma" engraved into a metal plate. Teags & Ry custom stainless steel hockey skate travel tumbler is ready to go along and celebrate all your sports!! Teags & Ry custom stainless steel hockey player travel tumbler is ready to go along and celebrate all your sports!! Teags & Ry custom stainless steel hockey player travel tumbler is ready to go along and celebrate all your sports!! One Size Fits All - Standard Fit Hockey Sock Set of 3. All featuring our goalie at the center! The perfect gift for sports fans of all ages - in every season!!! Hockey Sock Set of 3. All featuring our repeat player design!